Aloo bhujia Recipe / Potato Sev is one of the crunchiest Indian Snack Dish, made with potatoes, besan and spices. 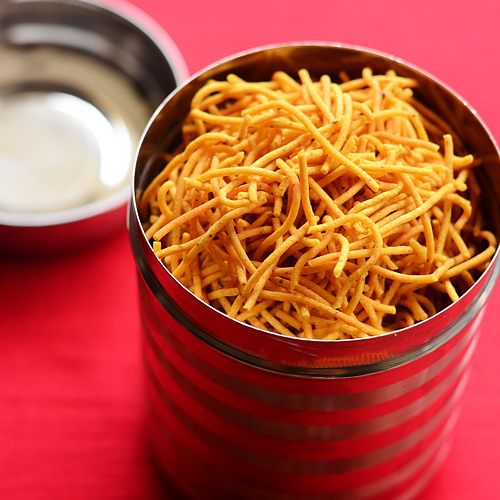 Aloo Bhujia is also known as Potato Sev or Aloo Ki Bhujia. 4 medium potatoes, 1-1/2 cups besan (bengal gram flour), 1/10 teaspoon asafoetida (hing), 2 tsp lemon juice, 1 tsp red chilli powder or as per your taste, 3/4 tsp garam masala powder, 1/8 teaspoon chaat masala, 1 tsp cashew nuts (blanched), 1 tsp peanuts, Salt to taste, Oil for deep frying. Pressure cook the potatoes for 4 whistles, till turns soft. Roast or fry the peanuts and cashew nuts in little oil and keep aside. Peel the skin of boiled potatoes and nicely mash them without any lumps. Take a big bowl and combine mashed potatoes, besan, lemon juice, salt, chaat masala, asafoetida and garam masala powder. Add little oil and knead into a pliable dough. AT this moment, the mixture will be little sticky, but thatâ€™s okay. Heat good amount of oil in a frying pan. Now carefully put the dough inside the murukku presser, and start squeezing in hot oil. Aloo Bhujia gets cooked very fast, so keep stirring and take it out as soon as it is done. The sizzle sound will subside once it is cooked and little browned. Be careful not to get it too brown. Repeat the same process for the rest of the dough. Drain aloo bhujia on the paper napkins and then quickly toss with fried cashewÂ nuts and peanuts. Homemade Aloo Bhujia are ready to serve.